A four-hour PBS mini-series reporting on the impact of the global economy on the American middle class, from the influence of Wall street on corporate downsizing, to the high-tech economy of California, how to educate high school students for the new economy, and several episodes of saving business, jobs and plants by innovative labor-management collaboration. 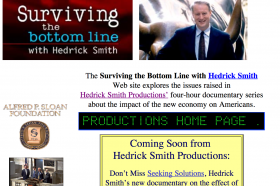 Hedrick Smith covers what drives the New American Economy and the choices Americans can make to determine their economic destiny. This four-part documentary series moves beyond Smith’s prize-winning Challenge to America. From Wall Street to the Mexican maquiladoras, Smith shows how the forces that have generated American growth and dynamism are also producing job instability for millions of middle-class Americans. Systemic changes in education and new kinds of labor-management cooperation bode well for greater U.S. competitiveness and a better living standard.